YAY!!!!! It really is a super combination and flatters all who dare to try it! You look fantastic in all of your variations (ha cha cha on all your shoes btw). Thanks for thinking my choice was inspiring!! Love you for that! All right back at you, dear Alyssa. It's been a day of trying not to weep over the agony in Oklahoma city. Saying nice things on other people's blogs is turning out to have some decent uses, after all. As always, you're a peach. I agree with your assessment of blue and orange. They play off of each other beautifully. I love that you are such a colorful person - not afraid of wearing it in the least! Show me more! Oooh. Thanks for the nice comments, Alicia. I appreciate them, one hot pepper to another! As you might imagine, while I'm sitting here writing, another part of me is trying to assimilate feelings about Oklahoma City. Bad enough to feel powerless to prevent, but awful to feel powerless to really help. To horrible to really wrap around. Have a great week ... and so glad you had a groovy birthday! I have noticed the orange and blue movement! And look at you, working it like a supermodel. Love these looks, and thanks for sharing with Visible Monday. Thanks for all, Patti. 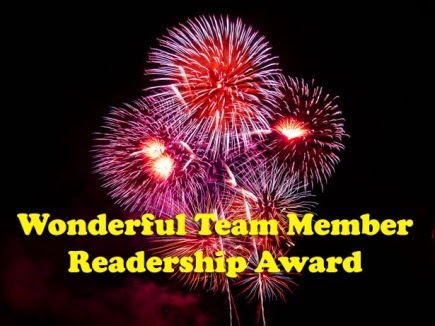 You are the best, of course, and I appreciate all it takes to put VM together. Mulling and fretting and trying to wrap around all that happened in Oklahoma City yesterday. 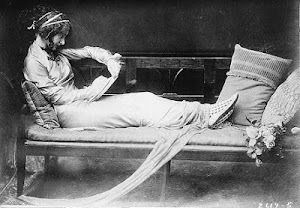 Answering blog comments acts like morphine ... a little. How honored do I feel to be one of your muses? Wow, thanks so much sweet Jan! You took it up a notch. Oh my gosh, how I love that peplum with those orange heels. Swoon. And that pretty floaty floral top. These colors were made for each other. Sweet to say that, Alison. I was seriously surprised everyone liked the polka dots so much. Not my fave, but will review my opinion. Oklahoma City events are on my mind a lot today. Glad I have the bloggy chores to attend to and keep the monsters at bay. You're right, this is a great color combination. I love your first outfit best, with the polka dots and those fabulous orange shoes! Thank you, Sparkly Val ... much appreciated. 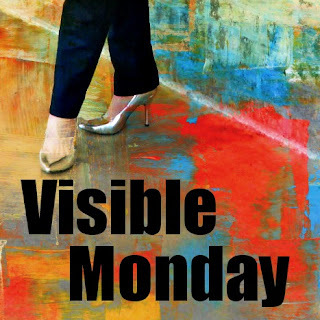 Hope you have a great week and that work is less of a grind this week! Wow! Orange and blue. Who would have thunk it? Actually I bought an orange and navy silk scarf at the thrift shop this week. Had no idea why at the time. Now I realize I was being subliminally inspired. That's a thing, right? You look wonderful in all your inspired outfits, but the polka dot one is my favourite. I am partial to the silver shoes though. Memories of the dress-up stuff at my grandparents' house. I'll have to keep an eye out for a pair of my own! Dress up stuff at Granny's? Really? Didn't see my cool silver shoes in quite that light. But glad you like them anyway. Thanks, Onion Girl, for stopping in. Glad to hear from you as always. I know, that doesn't sound complementary, but it is. My Grandmother liked to dress well, and there was awesome vintage clothing for dress up at her place. There were actually three pairs of silver pumps. My Mom's bridesmaids, aka her sisters, wore them to my parents' wedding in 1964. We grand-girls fought over who got to wear them. Seeing yours makes me want my own! ANYWAY ... have a great week. Kind of you to reply, but I didn't really take it amiss. Great fashion minds think alike! I always love orange & blue together. My favorite look is the polka dot top with faux peplum. I just bought a pair of silver metallic heels on clearance at Target and I am still trying to figure out if I am brave enough to wear it. Thank you for the inspiration & love that great fashion minds think alike! Ha! Hello, Alice ...your heels are probably just like the one's I'm showing. They've become favorites, and I wear them a lot. Wish the same for you! Thanks for stopping by. Glad to see you. You really do look GREAT in your outfits! I'm loving the floaty blouse by Simply Vera...very romantic & feminine. Asian flair might have something to do with it, too! :) How about your shoes! You go, Jan! I really didn't do that pretty blouse justice. I did some refashioning on it (removed some of what I thought was tacky blue lace off the arm edges.) Made all the difference. Will go to bed concentrating on my next shoe quest, and trying not to think of the horrors of Oklahoma City. Terrible, terrible event, and it's hard not to dwell on it. Off to find an uplifitng movie to watch. Jan, You look stunning in All of your looks! It's so nice to see you times three tonight. Thank you so much for waxing poetic over navy and orange. I had seen both the lovely Alison and the equally lovely Alyssa's posts, but of course it didn't sink in that I should be all over navy and orange myself. Must hear it 22 times before I get it, I guess. Anyways, I've got these cute orange sandals, my fun orange coat, and all sorts of lovely navy everything, so I'm off to work some of my own magic. Hello, Sue! Glad you had fun with the images, but don't think you need to be all over navy and orange, yourself! Only if you like it and seems like a good idea! This was just what I was thinking about. Whatever colors you decide to use, magic will result, as always. You are my color guru! My high school colors were orange and blue, and I'm afraid I was ruined...until now! I actually love the combo as you show it...especially the Asian inspired top and the "melon" hues. Nice job...I will definately rethink this! Ours were orange...and black! Go Cougars! But navy is softer and I've been out of high school way too long to feel the influence, anyway! So glad you get and like the Asian influence. It's a part of the last couple of seasons that I hope is around for a while. We're just beginning to see it in stores! Thanks for stopping by, and for your kind comments! Love the orange and blue... And your fan. That looks like a bit of Southern drama about to happen right there! Thank you for popping in, Becky. Glad you liked the colors, and in fact, the fan circumvents dramas rather than causes them. I may live in the south, but I won't cop to being southern. I'm a Northerner, ma'am! Have a great week, and I appreciate your comments. Orange and blue together, that's a favourite! And you wear them so magnificently. I clap for the beautiful fan accessory. I'm hearing a lot about this Olowu these days... No wonder. I love your post title. Thanks, Mel. I always appreciate it when you stop by. Thank you for your comments ... never, ever had magnificently applied to my small self! Don't worry, it won't go to my head. Stay tuned, more fan stuff if everyone can stand it ... something to do with menopause. And more glib, punny titles. Can't control myself. Have a great week, White Cat! Ah yes to orange and blue. All of the choices are winners! Must remember this combination because it feels so fresh and pleasing. Thanks, Ann. So happy you came by for a visit. Glad you liked my orange and blue issue. New colors that I can wear until I'm sick of them! Orange and blue are great together but I love the image of the orange life vest on the ocean LOL. Must have been a bad nightmare that one. I love all the looks but my favourite is the first one. Very striking. Nightmare, perhaps. Dan worries that it's wishful thinking. No cruises for us, it looks like! Thanks, Suzanne, for stopping by. Always a pleasure. Thanks for your nice comments, Debbie. That's one of the best things about inspiration ... it's found everywhere! Thanks for your Shout Out, Jan! Love all these looks on you; you are a real cutie! Thanks, Paula for being inspiring! I appreciate you kind remarks, and thank you for stopping by! You put together some wonderful outfits with the blue/orange inspiration. 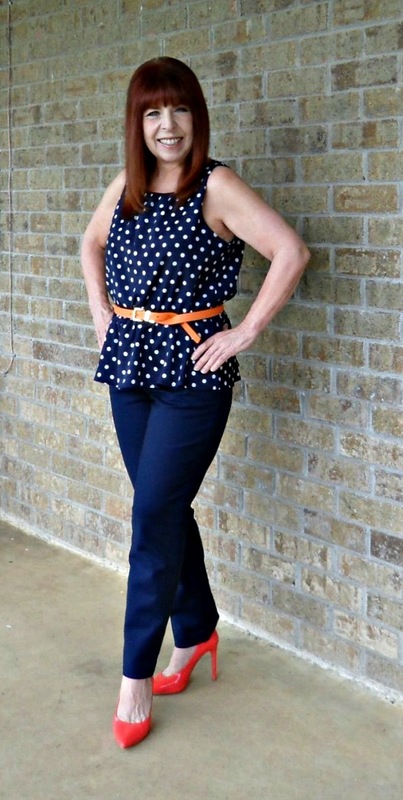 I especially love the navy polka dot top and pants. Now I'm going to have to think about coordinating blouse that's similar to this one with a bit of orange in some way. I had not thought of that possiblity for it. Glad you got ideas from my silly post! Always happy to provoke ideas. Have a great week, Lisa. Awww ... thanks for all your sweet comments, Curtise. Cocktails any time and lots of good talk,and for as long as it's possible to talk after cocktails! Have a completely cool week. You deserve it. I like what you did with the plain navy pants. You make them unique and stylish with any of the looks. My favorite is tAhe first one with the spotted top, I must be addicted to polka dots. Anyway you look lovely in each of it. Yup, I can see you in blue and orange with polka-dots. Thanks so much for stopping by, and I appreciate your sweet comments. Thank you so much for your wonderful words. They mean the world to me. You are, and look wonderful. I appreciate your lovely comment, Sacramento. Thank you for stopping by to visit ... you are always welcome. Well, if Clara wears them, I'll happily copy her! Melon and Tardid blue, I think! Thank you, Kez. I'm glad you stopped by! That's TARDIS Blue ... oops. What great looks. I especially love the polka dot blouse. It's a great outfit with a pop of color in the shoes. 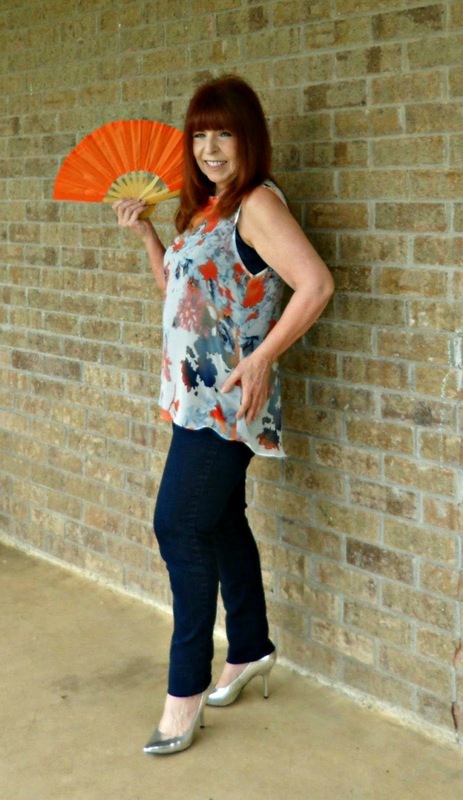 The Asian top is a great go-to blouse to wear with any color pants. Depending on your mood, you can pop or blend in. It's a perfect purchase. I just couldn't get a picture that does that little chiffon top justice. Way prettier than in my photo. You're right ... I'll wear it to rags. Thanks, Zalina, for stopping by. I appreciate your very kind comments. More people should rock a fan! Oh, dear, Wendy. I'll be showing more than anyone wants to see. I love them, and here, they're a necessity. Bad habit left over from menopause years. It will quickly reach 115 here, often with 90 percent humidity plus. There's always the danger of looking more elderly than necessary, but I try to keep them clean and modern in style. Oh, wow. Wardrobe TMI !!! Thanks for stopping by! I love all of these outfits , your shoes are to die for. My favorite is the first photo because those orange heel are a great contrast with the blue. Looking fabulous as usual . Have a great weekend. Thank you, lovely Carrie. I appreciate you kind words, and for popping by. More shoes to come. I'm on a roll, and besides most outfits need them. You have a great week, yourself! I really love the Vera Wang top. It's a lovely print. Navy and orange are always a great pairing! They were new to me, but not anymore! I have a few pieces of her Simply Vera line ... as close as I'll ever get to her higher end designs. She's a favorite, and a great example of growing ageless. Thank you for stopping by, and your kind remarks. You are very welcome, always. I'm also crazy about the Vera Wang top... that woman can do no wrong! Isn't she? So glad to hear from you. I was wondering where you got to! Hope your husband is in better health, and that the world has lightened up on you just a tad! Thanks for your comments, and for dropping in to say hello. The Vera Wang top is a dream! Too bad there's no Kohls here, I would go and get it instantly. Navy and orange, I hadn't seen it before except in sportswear, and your pairings were anything but. Really stylish looks, especially liked the first. Seems like I have to keep that in mind. I'm more comfortable with it now ... I've never liked orange on it's own, but the blue makes it sing instead of scream. I'm so glad you like my combinations. Thanks so much for stopping by. I'm always glad to hear from you. Hi! You were late to join in the party this week, weren't you? I was there at Patti's earlier this week but didn't see you nor was there any post alert on Bloglovin'.. anyway, love orange and navy, i think they really compliment each other. The first outfit is a stunner. I had to pause for a while, a long while actually. The rest are equally gorgeous but the first one is the winner as it was simple yet a scroll stopper! Time zone lag? I posted late Monday afternoon. And usually, I don't put a picture of myself on the VisMon site. Lately they've been of my feet (and that seems like an odd thing, when I say it that way.) Just shoe obsessed these days. I'm always behind everyone else! Bloglovin' has felt slow to me lately. So glad you liked my combinations ... means a lot coming from you. I'm always pleased when you stop by. Thanks you so much. Sorry Jann, I didn't delete my comment on purpose, I'm playing around on my iPad since I'm on the road (obviously I'm not too great on it). I just noticed the comment had my old blog from years ago. I'll comment again when I get home. Not to worry Trina ... you can't hide from me (bwaaaahhaaahaa!) Hope you're having a great trip, wherever you are! Thanks Jann, I'm actually moving my daughter and son-in-law to Omaha, Nebraska. He will be attending Creghton University to finish his Dental program. They just wanted Trina momma's help with decorating. Sweet of you to say, Jean! Thank you for your very kind comments, and I'm always happy when You drop by for a chat. So you know ... the drawings of my outfits are not generated by a computer. They're drawings I made ... like real paint and pencils, but with digital "paint". I do them from scratch, as it were. I miss doing them, but I haven't had much time. Photos are more difficult to live with, in a way. Anyhoo ... I'm looking forward to seeing your jewelry soon! the first outfit is definitely my favourite, I love the idea of the false peplum, I must try it myself!! From you, high complements, indeed. I'm really having to rethink my choices ... I like how the first one looks on me least of all. Have a great weekend, what's remaining. That little orange belt was a good purchase. I use it way more than I ever thought I would. Hard, too, to find a decent belt with gold hardware rather than silver, so I'm extra pleased. Thank you for stopping by, and I appreciate your kind remarks. You're always welcome here! So kind of you Debbie ... will get back to you at your place after my busy weekend (hope it's busy at the pub, anyway!) Sweet girl! I love navy and I haven't worn it with orange, but this makes me want to try it! You look great in all of these outfits, but I really love your top in the last photo! I'm guessing you have some primo navy in your vintage collection. I'd think this combo would go great with your coloring. Yes, I'll wear that top to rags this summer! P.S. Thanks for your comments ... I always like to hear from you. Hey, Sharon! I'm getting used to the unusual combo pretty easily! This tote rocks, and I never have to look around hard to find where I last put it! Thanks for your kind comments ... come back soon! Cute outfits, I especially like the top! The polka dot peplum top is sooooo cute! Orange does not really work on me, but I do like it on others! Have a good weekend! I'll bet that you have some pinker coral pieces in your wardrobe that work with your fair skin ... I'm seeing that a lot here with aqua, as well, and with teal. Thanks for popping in, and come back soon! This is definitely a movement I can wrap my total self around. Navy and orange are two of my favorite colors and you are stunning in every interpretation of this combination. I am especially taken with the polka dots with orange belt and shoes. However, your smile and warmth are your most impressive accessories!